There are so many wonderful APIs out there but they aren’t always easy to work with in mobile apps. The Siesta framework makes using APIs in Swift apps a joy. Not only does it answer those questions but as soon as one changes it broadcasts answers to anything interested in listening to them. It also caches the results so you don’t make the same network request twice unless you need to. Let’s get started so we can catch ‘em all. This starter project from Github which contains some pre-built user interface screens and project structure to save some work in this tutorial. We’ll clone this in the next step. Note: If you get an error trying to install the pods you may need to run pod repo update to refresh the local CocoaPods spec repo. This might take a while. If you want to know more about CocoaPods you can read this blog post. Open the PokeapiDex.xcworkspace file that CocoaPods in Xcode by running open PokeapiDex.xcworkspace. Build the project once before we get started to resolve the dependencies inside of Xcode. If you don’t do this Xcode won’t provide completions for the dependencies we added using CocoaPods. Now that we have the Siesta framework for working with APIs and SwiftyJSON for easier JSON processing we can dive into creating our Pokédex. A Service in the Siesta framework represents an API. We need to create one to represent the Pokeapi. Create a new iOS Swift file (iOS->Source->Swift) in the API folder called Pokeapi.swift. We’ll create the Pokeapi Service as a singleton to be used anywhere in the project. We’ll use a private init() function so that _Pokeapi can only be instantiated from this source file. This code creates a Service representing the API found at https://pokeapi.co/api/v2. It configures the service to parse responses from the API using SwiftyJSON by hooking into Siesta’s robust transformer pipeline. We also set the expiration time of the cache to 1 hour for all resources since our data won’t actually change. The default of 30 seconds makes much more sense for an API which has contents that change frequently. With our Service created we can start working with the resources that are available in the Pokeapi. This Resource property will fetch the first 151 Pokémon from the Pokeapi and make them available to any object that observes them. 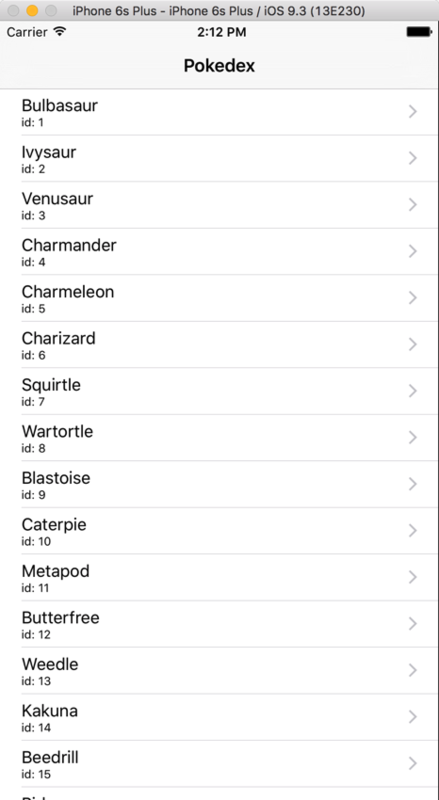 The PokedexViewController will use this Resource to display the list of Pokémon in a UITableView. Let’s wire that up now so we can see Siesta in action. The resourceChanged() function will be called when the resource broadcasts a change event. This usually means new data is available. The typedContent() function is a convenience method that returns a type-casted value for the latest result for the Resource if available or nil if it’s not. In our case it’s a SwiftyJSON array of Pokémon ready to be displayed in the table view. In viewDidLoad we set the pokedexResource property to the Pokeapi.pokedex resource we declared in our service which kicks the whole resource fetching process off. cell.detailTextLabel?.text = "id: \(indexPath.row + 1)"
This is standard UITableViewController code. We have one section that contains a number of rows set to the number of Pokémon in pokemonList. In the tableView:cellForRowAtIndexPath function we get the Pokémon summary JSON that corresponds with that row. We then use SwiftyJSON to get the name out of the JSON and capitalize it and set it as textLabel.text. Then we display the id of the Pokémon in detailTextLabel.text. Now that we have a list of Pokémon it would be really great to see more details about them. First we’re going to need to create a data model for a Pokémon. We built the Pokémon list using JSON data because we only had one field to work with. For our Pokémon details screen we’re going to be working with more properties so let’s create a model for the Pokémon data. The Pokeapi is going to return us data in JSON format and we’ll want to represent that data in Swift data structures. The initializer takes in JSON as a parameter and sets the Pokémon’s properties using SwiftyJSON. Note that the types and spriteUrl properties are optionals. This is because they might not exist for a given Pokémon. This code allows us to call Pokeapi.pokemon("1") to get a Resource for the Pokémon with id=1. Let’s use that to load the details page with our Pokémon data. This code sets the pokemonResource property on the destination PokemonViewController with a call to Pokeapi.pokemon(id) passing in the id for the tapped Pokémon. The first time a Pokémon loads it is fetched from the API but if you tap on it again it will load immediately since Siesta caches the value in memory. That’s it, you built a mini-Pokédex using Pokeapi and the Siesta framework. Now go out there and catch ‘em all! 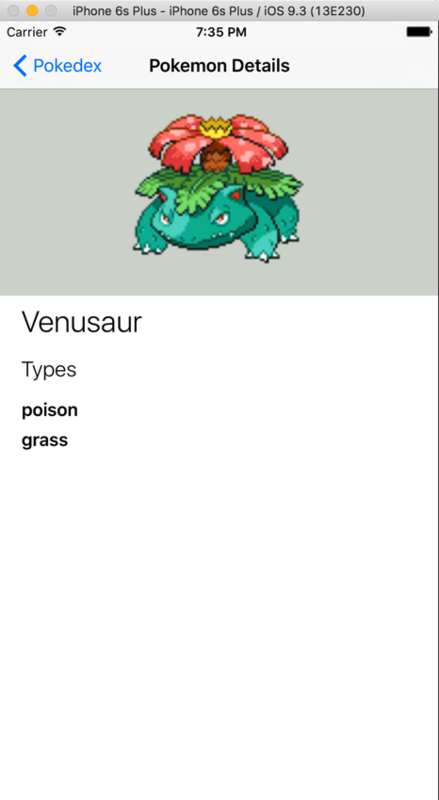 With the aid of SwiftyJSON and Siesta we were able to create an API-driven Pokédex based using Pokeapi.co. Siesta removes a lot of boilerplate networking code and focuses on managing the resources in the API you’re working with. This means we were able to focus mostly on app logic and way less on writing network code. Let me know what you decide to build. You can find me on Twitter @brentschooley or email me at brent@twilio.com. Happy Pokémon hunting!